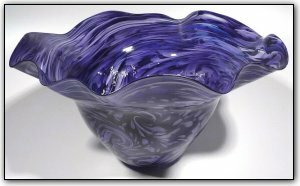 This fluted bowl features many shades of swirling purples, with white accents throughout. Make sure to zoom in and see just how thick and luscious the colors are, and the way the various shades interact with each other. This bowl also sits very nicely on its side if you want to display it like that.